Marmot minutes: From marmots to hermit crabs! My introduction to marmots occurred in the Fall 2010 quarter as I contributed to Matt’s study, watching videos of marmots in an open field experiment and scoring their behaviors. Working on this project inspired me to think about the entire research process, including the steps it took to create all the videos I was watching as well as the steps that would follow after all the marmot behavior had been scored. My project was only a small part of this complex process. I made a decision that before I graduated, I wanted to conduct my own research and experience the whole process from beginning to end. Since it would not be possible to work with the adorable marmots, at the beginning of the Winter 2011 quarter, Professor Blumstein suggested an animal behavior project with hermit crabs, and as a huge fan of crustaceans, I could not have been more excited. 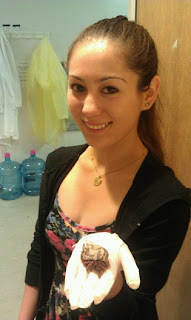 My own hermit crab project focuses on animal personality and behavioral syndromes. Animal personality is not the same “personality” we use when referring to humans; instead, animal personality refers to consistent behavioral differences between individuals. Personality has been identified in many vertebrates and invertebrates, including aquatic hermit crabs. In my experiment, I am looking for evidence of animal personality in the terrestrial hermit crab (Coenobita clypeatus). I am in the process of performing four separate experiments in which I will quantify their behavior in order to study the variation between individuals and the consistency of this variation over multiple trials. In addition, I will look for evidence of behavioral syndromes, which refer to correlations of the consistencies in the behavior of the population across different contexts. I am working in the lab of Professor Aaron Blaisdell. With the help of Professor Blaisdell, Professor Stahlman, grad students and post-docs, and of course Professor Blumstein, I aimed to study personality in this species of hermit crab and identify correlations that may exist in their responses to the various situations I expose them to. My first experiment was a manual inversion test. I flipped the hermit crabs over, so the aperture of their shell faced upwards, which caused them to retract into their shell. I measured the time it took for each crab to emerge from its shell. This is a screenshot from an inversion video. The white box shows that the detector program identifies enough red pixels of the crab to determine the crab has re-emerged. My second experiment was an open field test. I placed the crabs in a 100 x 100 cm open arena and measured variables such as the latency to emerge, distance travelled over 5 minutes, and maximum speed. 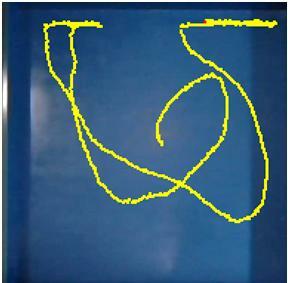 This is a picture of the path that one of the crabs travelled in the open field test. My third experiment was a visual predator habituation test. I placed the crabs in front of a monitor which displayed an image of a hawk that appeared to swoop upon the crab. Each subject received repeated trials until they habituated to the hawk and did not display a hiding response. I measured the latency to emerge between trials, latency to hide after the hawk first appeared, and how many trials it took for crabs to habituate to the predator. This is a picture of a crab that emerged from its shell in front of the monitor. 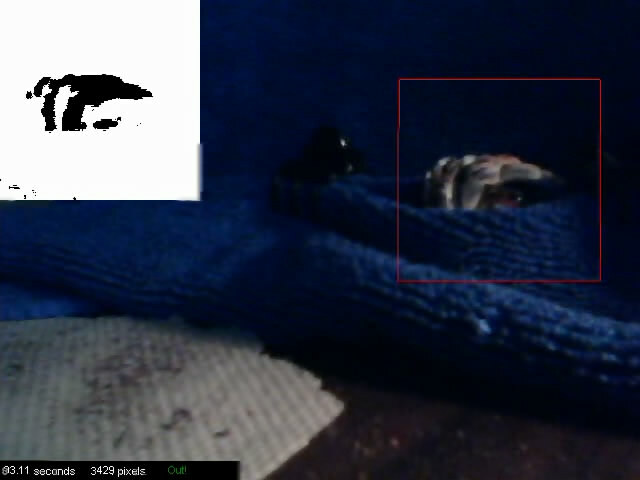 This is a picture showing the crab hiding because it saw the image of the predator (huge picture of hawk on right). I have not yet completed my fourth experiment, which is a shock test. I will give hermit crabs a light electric shock using a Skinner box to initiate a withdrawal response. I will then measure the latency of the crabs to re-emerge. I am beginning to analyze my data, which does seem to suggest consistency in individual behavioral variation across trials, i.e. personality, as well as some cross-contextual correlations. I look forward to further analyzing my data and finding more interesting correlations in hermit crab behavioral responses. I feel proud that my experiment is a small step on our way to understanding why this behavioral variation is maintained. Taking advantage of the opportunity to do an independent research project was a great decision. It has been a lot of work, but an extremely rewarding experience and I am excited to continue working with the hermit crabs and share this experiment and my results at multiple upcoming poster sessions.